This garter stitch ball is about 4 or 4.5 inches in diameter -- about the size of a grapefruit -- and is shaped by short rows. It's a good for using up odds and ends of yarns of different colors. Each section takes about 4 yards of yarn. This is a perfect toy for a child about a year old, just at the age they begin to walk -- it's soft, easy to hold onto, machine washable and dryable (if made and stuffed with synthetic materials), and can be made in bright, attractive colors. The pattern is based on a 10-section ball pattern posted by Valle to the Knitlist at Christmastime, 1995. The original pattern is archived at Emily Way's Wool Works. One reason I changed it to 12 sections was because 12 is divisible by more numbers, so the possibilities for color combinations are increased. My favorite (shown here in the inside-out version) is red - white - blue - white. Also see photos of both versions, the "right-side out" and the "inside-out," in progress. 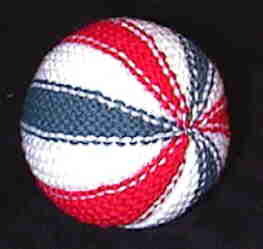 And other people have been inspired to create their own variations on the yarnball! Take a look at a Moon and a Swirl. Please notice that although I describe this ball as being knitted in "sections," the sections are not separate pieces, just one color wedge after another! The photos of the in-progress yarnballs show what I mean. Note that the needles are small for the size of the yarn. This makes a dense fabric so the filling won't show through. Repeat rows 1 through 10 until you have made 12 sections, one after the other. Bind off when you get to the end of the last section. Leave about a 12" tail to use for sewing up. Notice that since this is garter stitch, on one side there is a sharp boundary between the colors of the adjacent wedges, and on the other side the adjoining colors are interlinked. Decide which side you want to be the outside. With a tapestry needle, run the tail around through the end stitches of the rows and pull tight. (To make it extra firm, run the yarn around again.) Continue sewing up the open side about 2/3 of the way. Stuff the ball as firmly as you like and sew up the rest of the way. Run the yarn through the end stitches of the rows (twice if you like) and pull tight. Make a knot and run the end of the yarn into the ball and cut off. Hint: If you're going to use the "inside" as the side that shows (that is, the side where the colors of adjoining segments interlock), knit one last row in the color of the section you will be stitching to, then cast off. This will give you the last set of interlocking stitches, and let you sew together two edges that match in color. Make 12 sections and bind off, leaving a long tail. Sew up and stuff the ball. This one is a lot smaller. Keeping to my citrus theme, it's about the size of a tangerine (or a hackysack), 2 to 2 1/2 inches in diameter. Repeat rows 1 to 8 until you have completed ten sections. Bind off, sew and stuff. Hope you have fun making these! And feel free to pass the patterns on to your friends.